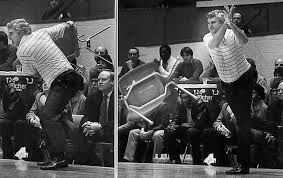 I was asked to write this profile of Bob Knight in February of 1985, when controversies were beginning to mount, as they tended to do in Bloomington. Knight had coached the U.S. Olympic team to a gold medal the previous summer, but the season wasn’t going well for his team. This story was a challenge, because I had to work on it between my responsibilities as a beat writer for both IU and Purdue. I also couldn’t talk with Knight, who wasn’t about to sit down for this kind of story during the season — particularly when things weren’t going well. At this point, no books had been written on Knight, and surprisingly few newspapers had attempted profiles. The first major piece was written by Bruce Newman of the Indiana Daily Student in 1975. It was excellent, and was the primary reason Newman got a job with Sports Illustrated right out of college. I did the best I could with the resources I had. 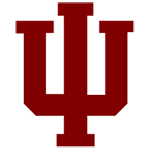 I was told later by Indiana’s sports information director, Kit Klingelhoffer, that Knight liked it. I always had mixed feelings when given that kind of compliment. Had I been too soft on him? The problem was, when writing about Knight, you were never likely to find someone willing to go on the record and be critical of him. That’s largely true even today, even among his detractors. Why put yourself through the harsh reaction from IU fans? That’s why I turned to a couple of newspaper reporters for commentary. Although friends, they could be objective about Knight. A week after this three-part series ran, Knight threw his chair across the court in the rematch with Purdue, igniting controversies to a peak level. So much for him mellowing, as my profile indicated. (c) 1985, The Journal-Gazette, Fort Wayne, IN. Reprinted by permission. It was a Friday afternoon at West Point Military Academy, 1964, when a 24-year-old private was called in to receive the opportunity of a lifetime. Tates Locke, the academy’s head basketball coach, was leaving to take over the program at the University of Miami in Florida, and the army brass, after sqjne hesitation, had decided to offer Locke’s former job to his young assistant, who had never been a head coach. But they didn’t get the eager and grateful response they expected. “Colonel, I’ll let you know if I’ll take the job on Monday,” Bob Knight told the startled officer. Knight’s hesitation was no ploy. Although he had voiced interest in the position, his two-year hitch in the service was near its end and he was considering enrolling in law school at UCLA. But in delaying his response, he reaffirmed an independence that has been the hallmark of both his coaching career and his life. Nearly 21 years later, Bob Knight is still doing things on his own terms at Indiana. Whether that means skipping Big Ten Conference meetings in protest of alleged cheating in the conference, playing an all-freshmen lineup plus senior Uwe Blab in a loss to Illinois or kicking Mike Giomi off the team for missing a few classes after being put on probation for flunking a class, his dogged insistence on doing things his way continues to inspire both admiration and dissent, leaving controversy in its wake.